The High Costs Of Colorado's High Water, By The Numbers : The Two-Way At least eight people have died. About 19,000 homes have been damaged or destroyed. 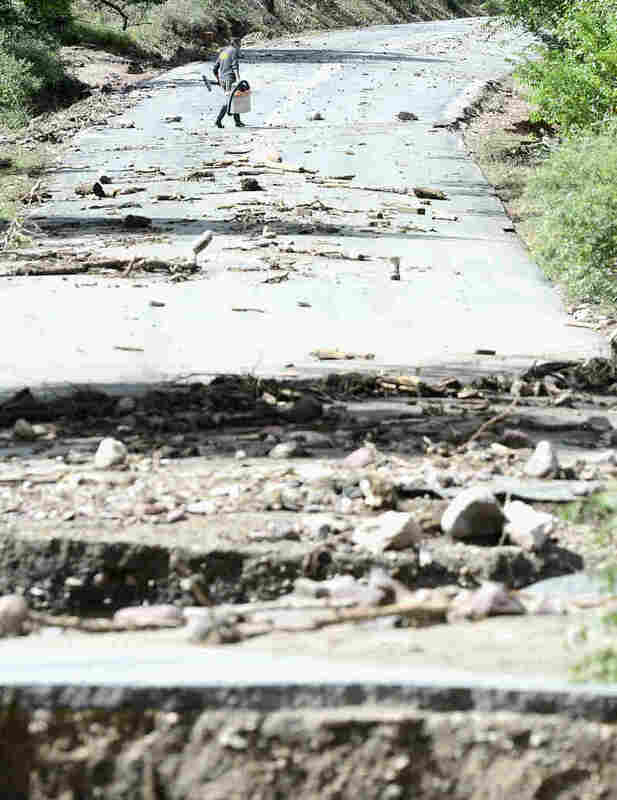 It's expected to cost about $500 million to rebuild damaged roads. Meanwhile, efforts continue to reach people stranded by washed-out highways. A man walks across the washed-out Wagonwheel Gap Road in Boulder, Colo., on Monday. -- causing up to $500 million worth of damage to roads and highways. On Morning Edition, Grace Hood from NPR member station KUNC reported that "towns are just starting to dry out from days of heavy rain and flooding" and that "helicopter recovery [efforts] cranked into full gear Monday afternoon." Hundreds of people remain unaccounted for. Most are thought to be OK but remain stranded because of impassable roads. Also on Morning Edition, Mark Benjamin of Bellview, Colo., spoke about rigging a zip line across a creek to help get supplies to neighbors. He talked about how the road to his home had been severely damaged and being "surprised" he was talking on the phone with NPR. He said he could see the fiber-optic phone line running to his property "hanging out there in space" where the road it was under had been washed away, Benjamin said. "So we're talking through the water right now," noted Morning Edition host Steve Inskeep. "You sound pretty good considering that." -- The Denver Post writes that "according to early state emergency management office estimates, 17,994 homes have been damaged and 1,502 were destroyed along a 200-mile stretch of the Front Range, but the numbers could change as the waters recede and emergency workers reach more isolated areas." -- Colorado Emergency Management officials are posting updates about the flooding and its toll here. As of 8 a.m. ET Tuesday, 11,750 people had been evacuated and 648 were still unaccounted for or missing. As we said, most are thought likely to be OK.
-- The Colorado chapters of the Red Cross are posting updates and donation links here.